In my head that seemed a reasonable enough account (and I felt quite chuffed I knew about Hanningfield Reservoir) but drawn out, it didn’t seem very comprehensive. My water is supplied by Essex & Suffolk Water (ESW), so I thought that I would check their website for a bit more detail. ESW have a service which provides maps of their assets, but this is aimed at people making property searches or developers, so provides maps local to property addresses rather than larger scale network maps – it’s also a paid for service (currently £18.48 for an A4 sheet) so this is an expensive route to take. I still didn’t have enough information to map water from rainfall to tap however, so I began some further research. A great resource I found online was a website on the subject of the Public Water Supply of Essex called WaterMatters put together by David N. Williams, the former manager of Langford Treatment Works. The site combines historical records and images (like the map below) with his own knowledge and experience. Williams writes that Burnham-on-Crouch became connected to the Essex water grid in 1960 when a 12 inch main was laid supplying Bradwell power station with water from the Langford works (this must be the trunk main indicated by the roughly diagonal line across the Dengie in the map above, which seems from its shape to be buried under the road). The Burnham connection presumably connected with the existing pipework of Burnham – perhaps at the site of the 1887 water tower that once stood on Southminster Road opposite St Mary the Virgin church – which was previously supplied by a local deep well. This all seems to indicate that Hanningfield Reservoir doesn’t play a major part in my water supply – that in fact it is piped from the Langford Tretament Works. Langford abstracts water from the rivers Chelmer and Blackwater. The grid of pipes does, however, connect to both to Hanningfield and Abberton reservoirs which allows access to not only the River Stour catchment but also the catchment of the Great Ouse (through the Ely Ouse to Essex Transfer Scheme (EOETS).) 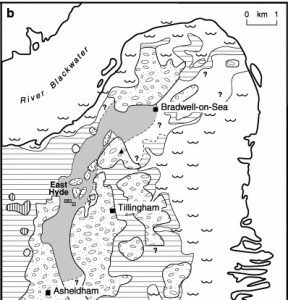 The EOETS was a response to the growing need for water in Essex, one of England’s driest counties, and pipes water from the Great Ouse that would otherwise exit into The Wash into the Essex water transfer system. So the water coming out of tap may have fallen as rain over a hundred kilometers away, and from the rivers Ter, Chelmer, Blackwater, Stour, Cam, Lark, Little Ouse, Wissey, Great Ouse and more – a catchment area of several thousand square kilometers. Next up: I’ll try and answer – How many days til the moon is full? Previous Post Where You At? Next Post Where You At Q2: How many days til the moon is full?